With the assistance of a knowledgeable team of experts and wide infrastructure facility, we have been able to manufacture and supply a wide range of Brass Molding Inserts. Our offered inserts are designed in such a manner that these meet specific requirements of customers. Ensured for their conformity with the international quality standards, these products are assured for their perfect design. 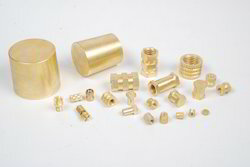 We are one of the distinguished manufacturers and suppliers of a superior grade array of Brass Inserts. This range is manufactured using quality tested raw material and advanced machines that are installed in our manufacturing unit. Moreover, clients can easily avail these inserts from us and that too at competitive market prices. 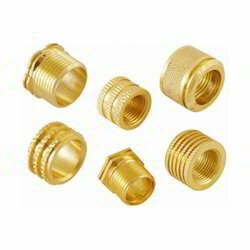 We are offering Brass Knurling Inserts for plastic moulded goods. Our assortment of Brass Moulding Inserts is widely renowned by the clients, owing to its properties like high tensile strength and rugged construction. We are offering these products at market leading prices. 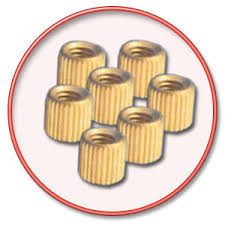 We are manufacturer and exporter of all kinds of brass threaded inserts for wood and plastic moulding. Brass moulding inserts are mainly used in Plastics Industries, telecommunication Equipments, Automotive Industries, Electrical Junction box, Sanitary fittings etc. We have standard series of Threaded Inserts such as Straight Hole, Collar Inserts, Blind (Closed bottom), Press in, Tri Slotted Inserts, Ultrasonic etc. 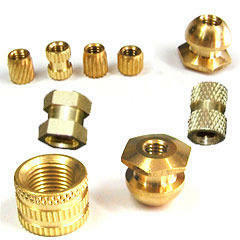 We can also develop brass inserts as per custom design & specification. – High Grade Free Cutting Brass. – Any Special Brass Material Composition as per customer’s requirement. Size: 1/8″ to 3/4″ or 3mm to 16mm or as per custom designs. Threads: ISO Metric (MM Threads), BA Threads, BSW Threads (Inches), UNC, UNF Threads and any threads as per specifications. Finish: Natural, Nickle Plated, Tin Plated or any coating as per customer specification.